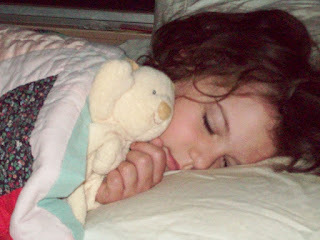 I was recently given the opportunity to review a Satineesnugs Bear Blanket from My Embroidered Gifts. These are adorable lovies or security blankets with a fun animal friend. We were sent one for Ashley to review. She is a regular lovie connoisseur, so I let her give her opinion as the resident expert. Ashley has a birth defect called hemifacial microsomia. This basically means the left side of her skull is smaller than the right. It is a mostly cosmetic, but has also caused some other problems, as the whole left side of her body tends to be a bit problematic. She also had lazy eye at birth, plus just generally problematic vision. All these things have led to countless surgeries, tests, and yucky procedures. 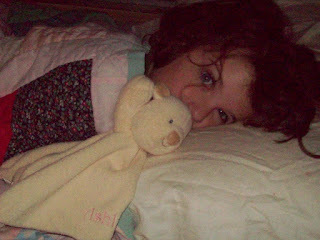 During every medical ordeal, a lovie has been her constant companion. Some might think she is a bit old for them now, but they make her feel safe in secure. My opinion is, why mess with a good thing? I will not separate her from her lovies, they help her cope. Anyway, she welcomed "Bear Bear" with open arms. I was very impressed by this because not all snuggly animals are worthy of sharing her bed. 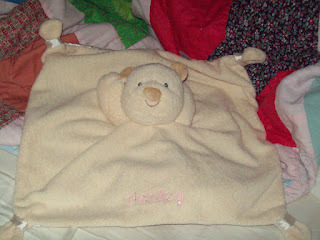 Ashley really likes that this bear is a blankie too. She says it makes her feel snuggled and safe. Plus, it has her name beautifully embroidered on it, which she absolutely loves! This Satineesnug has slept with her every night since it arrived. The little miss gives it two thumbs up! This little guy will be her lovie of choice for quite a while I think. As a mother, I think this product is great! This adorable lovie would make the perfect baby gift. I know that I would have been thrilled to receive one of these, wonderfully personalized for my new bundle of joy. It is incredibly soft and cuddle, perfect for the little ones in your life. You can choose the font you would like it personalized in, as well as choosing which Satineesnugs you prefer. They do not only come in bears, but in other cute animals, such as frogs, puppies, kitties & more, and in different colors. They are all adorable! Plus, they are reasonably priced, which is a real plus in my book. I really think these will be gifts for any babies that I might need to buy for. I feel they would be a lovie that you can keep and treasure always. We were really impressed with My Embroidered Gifts and the Satineesnugs Bear Blanket. I urge you to check them out, as well as all the other cute products the website offers. I bet you will find something you love! to see ashley hugged up to it is adorable. and i don't care what age you are to have a "lovie". I know in my 30's I still had a special soft blanket to snuggle with in bed! Love Ashley's review!! I also love My Embroidered Gifts. What a great site. Your review is terrific...found your blog on Mom Made That.